will think that the CS2.4's bass is actually not very deep at all because it lacks additive warmth and weight." Features Refined three-way time-and-phase-aligned speaker that uses Thiel-designed and -manufactured drivers, including "a new coincident driver array, which places the tweeter dome at the center of the midrange driver"; "the veneer is book-matched, and the workmanship is impeccable." is to sit far enough away to allow the drivers to integrate, but, at least in my case, only a little farther away than the speakers are apart from each other." Value "Audiophiles with refined tastes and tight budgets can think about and own this speaker." One of the very first articles I wrote for SoundStage!, penned when the site was the equivalent of a bunch of typewritten pages stapled together, was on the venerable Thiel CS3.6 loudspeakers. I first heard the '3.6es during a trip to New Mexico, and I was immediately impressed. When I returned home, I bought a pair. Why then did I not keep the speakers I bought? I had one heck of a time getting them to sound good consistently -- from recording to recording, that is -- in my small listening room. I tried many different amplifiers, but only one, a Mesa Baron tube amp whose output impedance shelved down the CS3.6's ample high-frequency energy, made the sound pleasant enough for long-term listening. However, the problem, as I came to learn, was not the equipment at all. My room didn't allow me to sit far enough from the speakers for the drivers to integrate, and therefore the tweeter was beaming. I eventually sold the speakers to a friend who loved them in his large living room, and I considered the whole thing an educational experience. Then, in 1999, I flew to Lexington, Kentucky and toured the Thiel factory. At the end of the tour, I had the opportunity to listen to a variety of Thiel speakers, including the CS2.3 and CS7.2, in Thiel's large purpose-built listening room. Both speakers sounded fabulous -- extended and very palpable, casting images that were startling in their solidity. This experience cemented in my mind that I hadn't given the CS3.6es the opportunity to shine and made me anxious to hear another Thiel speaker in my listening room. Since 1999, we've reviewed a variety of Thiel's offerings, including the CS1.5, CS1.6, CS2.3, and CS7.2. The '1.6 and '7.2 received year-end awards from us, and during the presenting of an award at last year's CES, I got to see and hear the new CS2.4. I asked Kathy Gornik, Thiel's president, about reviewing it later in the year, perhaps in conjunction with the company's SW1 subwoofer. She agreed, and here we are. So often audio companies will tout new products as "our most current thinking on the subject of good sound" or some such thing, but there are outward signs of this with the CS2.4. It certainly looks like a Thiel speaker, and in its execution it displays refinements that let you know Thiel is a company constantly in search of ways to make better products. Thiel is a soup-to-nuts affair, not only doing all design and manufacturing in its Lexington factory but also building drivers and performing testing there as well. Consequently, Thiel controls all aspects of the speaker-creation process. With the $3900 USD-per-pair CS2.4, this translates to a new coincident driver array, which places the tweeter dome at the center of the midrange driver, with the two sharing the same voice coil. The crossover from tweeter to midrange, which occurs in the 3-4kHz range, is mechanical, eliminating the electrical crossover and its concomitant additional parts. The coincident array uses neodymium magnets, which improve the drivers' efficiency, and a redesigned magnet-venting system to further reduce resonance. In the end, if you know even a little about driver design, you have a sense of how incredibly complex this element of the CS2.4 is -- and how much it means to the sonic outcome. The CS2.4's woofer uses the short-coil/long-gap motor system championed by Jim Thiel and is powered by a 2 1/2-pound magnet. The driver's cone is aluminum, a material that Thiel settled on after testing many others. I know -- I saw the box of rejects when I visited the factory. Along with the CS2.4's 7 1/2" x 11" oval-shaped passive radiator, this 8" woofer is said to produce "exceptionally clean bass down to 33Hz." Thiel has always taken cabinet construction to heroic lengths, and in the case of the CS2.4, this translates into 1"-thick cabinet walls and a 3"-thick front baffle. The baffle's rounded edges reduce diffraction and its slope is said to correctly time align the speaker's drivers. Of course, Thiel champions time and phase alignment as the key to proper sound reproduction, and consequently the CS2.4's tweeter/midrange array hands over to the woofer via a first-order slope at 1kHz. The CS2.4's manufacturer-supplied bandwidth is +/- 3dB from 33Hz to 37kHz. But the CS2.4 is said to be 87dB sensitive and possess a 4-ohm nominal impedance. Not surprisingly, recommended power is 100-400Wpc, which suggests that solid-state amplification is necessary. The CS2.4 measures 41 1/2"H x 11W x 14"D and weighs a solid 70 pounds. Outrigger stands that effectively give the speaker a broader base and make tipping less likely are available, although the CS2.4 is certainly not prone to such without the stands. Consider them if you have little audiophiles crawling or walking about. Beefy spikes come with the CS2.4s for coupling the speakers to the floor. Although the CS2.4 has the contoured and sloped profile of a recent-vintage Thiel speaker, it shows great visual refinement as well. Its baffle is flawlessly finished and emits a soft, graphite-black hue. The CS2.4's grille is little more thick than the metal of its frame and fits into an indentation on the baffle (and attaches via magnets embedded in the baffle -- no posts and holes), making for a perfectly flush look. The veneer is mirror-matched, and the workmanship is impeccable, befitting the very best furniture you'll see on Antiques Roadshow. The review speakers came in morado, a grainy, reddish wood that looks smashing but costs more than the standard walnut, ash, black-ash, cherry, oak, and maple finishes. The speaker is veneered all around, and its beauty encourages touching. Its relatively small footprint and dainty proportions will make the CS2.4 more décor and spouse friendly than larger speakers. All in all, I can't think of another speaker -- or another audio product -- that's more attractive. I used the CS2.4s with a wide range of electronics, including Lamm ML1.1 and Mark Levinson No.434 mono amplifiers, Mark Levinson No.383 and Unison Research Unico integrated amps, a Lamm L2 Reference preamp, an Esoteric DV-50 universal audio/video player, a Zanden Model 5000 Mk III DAC, and a Mark Levinson No.37 CD transport. Interconnects and speaker cables were from Shunyata Research (Aries and Andromeda), Analysis Plus (Solo Crystal Oval and Solo Crystal Oval 8), or Nordost (Valkyrja). Power cords were from Shunyata Research (Anaconda Vx, Taipan, Python, and Diamondback); power conditioning was via an original Shunyata Hydra, the new Hydra Model-8, or a Sound Applications XE-12S with 20-amp Elrod power cord. All electronics sat on Target equipment racks and/or Silent Running isoBase 3.0 bases, with the digital player or transport resting on a Bright Star Big Rock and Townsend Seismic Sink. I set the CS2.4s up in three different rooms and through this discovered a formula that worked well with the speakers. The CS2.4s are nearly as finicky as I found the CS3.6es to be so many years ago, but with the speakers about nine feet apart and my listening seat ten feet from the speakers, the soundstage the CS2.4s created was exceedingly wide and deep. This configuration had the drivers pointing so they fired at my shoulders and I couldn't quite see the inside edges of the cabinets. If I sat farther away, the CS2.4s had a tendency to shorten the soundstage, making for performers that were noticeably smaller than they were when everything was ideal. Perhaps, in this case, the speakers could have been moved farther apart to compensate, but the rooms in which I set the speakers up weren't large enough. Thus the key to setting up the CS2.4s (and the CS3.6es) is to sit far enough away to allow the drivers to integrate, but, at least in my case, only a little farther away than the speakers are apart from each other. I suspect that in terms of setup, however, the CS2.4s, with their coincident driver array, are not as prone to beaming as the CS3.6es -- if you're too close, that is. Over the years, I've reviewed a number of large and pricey speaker systems, and new speakers that arrive have to contend with the accumulated aural knowledge these others have created. This isn't to say that only magic will do whenever a new speaker takes its place in my audio system, but a person can't listen seriously to the lineup of loudspeakers I've heard and not have certain expectations. Add to this the experiences I've had with other Thiel designs, and you can imagine that I was anxious to hear the CS2.4s. They didn't let me down. The CS2.4 is a honey of a speaker. It's a precise, high-fidelity design that's able to convey differences in recordings and equipment with ease, but it's also poised and very enjoyable to listen to -- not aggressive or in your face (unless fed a signal that will make it this way). As impressed as I was with the CS3.6 so many years ago, I'm more impressed with the CS2.4 now. First, the CS2.4's high-fidelity nature. If you want warmth or sweetness or some other coloration from your speakers, the CS2.4s will disappoint you -- they're far too neutral. This applies not only to the treble and midrange, which are seamlessly handled by the coincident driver array, but also the bass, which goes deep. This was, in fact, the first thing I noticed in terms of the CS2.4's sound. On bass favorites like Harry Connick's She [Columbia CD- 64376], the CS2.4s proved to be up to the challenge, energizing my listening room with low frequencies that surprised me. The CS2.4's bass is an aural illusion of sorts. The CS2.4 is a medium-sized speaker, but then it lets out deep rumbles that make you think you're hearing a speaker that's much larger. But don't mistake bass depth for bass prominence. Some listeners, I am sure, will think that the CS2.4's bass is actually not very deep at all because it lacks additive warmth and weight. Really deep bass is often more readily felt than heard, and this is the case with the CS2.4's lowest reaches. I pulled out a few pipe-organ recordings, including my favorites from Michael Murray on Telarc. I've owned Bach in Los Angeles [Telarc CD-80088] and A Recital of Works by Bach, Messiaen, Dupré, Widor & Franck [Telarc CD-80097] for more than a dozen years and played them on more system combinations than I can recall. Here, with the CS2.4s, the lowest notes were nimble and highly detailed, able to convey subtle changes in pitch and pressure of the great organs Murray played. What I didn't hear was bloat or fuzziness -- the sort of things you hear from the bruisers you see in the listening room at Best Buy and trick people into thinking they have deep bass. The CS2.4s offer the real thing. The treble and midrange of the CS2.4 are highly resolving and have the sort of seamlessness often associated with electrostats and planars. If anyone can hear a crossover point in these speakers, that person is either a bat or delusional. Voices leap from the CS2.4s with an overt lack of adornment and thus sound about as real as reproduction gets. SACD helps in this regard, and one of my favorite vocal SACDs is Freddy Cole's Merry-Go-Round [Telarc SACD-63493]. Cole certainly sounds like his famous brother, but on this SACD you can hear how different his playing and singing are -- a bit less restrained. Through the CS2.4s, Cole's voice is soothing, like melted butter on crumbcake, though not due to anything the speakers themselves are adding. Even if you've been an audiophile who can't handle the truth from recordings, preferring a darker, more syrupy view of things, you should hear your favorite singers on the CS2.4s. It's a treat. I alluded earlier to the soundstage that these speaker can conjure, and while some more expensive designs like the Wilson Audio WATT/Puppy 7 can improve upon it, I'm confident that the CS2.4s can fill even a large room with a panorama of music. The Wilson speakers are also less restrained in their dynamic abilities, able to go from soft to very loud in an instant. The CS2.4s, on the other hand, need lots of amplifier help to accomplish this. Although I obtained good results with the Lamm ML1.1 tube monoblocks, the CS2.4s sounded their best with plenty of solid-state power behind them. I loved the combination of the CS2.4s with the Mark Levinson No.383 integrated amp and Esoteric DV-50 universal player, all of which were connected with Analysis Plus cables. Such drive, resolution, and spaciousness -- all from a complete system that costs far less than a pair of Wilson WATT/Puppy 7s or Lamm ML1.1s. An even lower-cost alternative to the No.383 is the Unison Research Unico, a hybrid integrated amp that costs $1495. Its 80Wpc drove the CS2.4s to very loud levels, and its silky sound made for some memorable listening. A speaker like the CS2.4 can start an audiophile thinking. If it were the top-of-the-line offering from a small and relatively unknown maker, it would be the next big thing -- coveted by audio reviewers, glorified by owners, and costing at least double its $3900 price. That it comes from Thiel, a cornerstone in the high-end-audio business, means that audiophiles with refined tastes and tight budgets can think about and own this speaker. Magnepan's MG1.6/QR is an amazing speaker, one that I praised as the best audio product I came across in 2002. It offers advanced technology, conversation-piece looks, and glorious sound -- all for under $1800 per pair. In a world in which the MG1.6/QR exists, why would anybody with the room for the Maggies consider another speaker? The Thiel CS2.4 answers this question in dramatic fashion. First, consider décor -- the CS2.4, with its furniture-grade good looks, wins hands down. Next, think about the power that both would need -- stout solid-state amplification or gutsy tubes. In this regard, the CS2.4 is perhaps a little easier to drive -- it's more sensitive, making those added watts you'll have to pay for go farther. Finally, there is sound. The CS2.4 offers a more neutral and incisive view of the music, although the MG1.6/QR counters with midrange purity and the rare sort of pleasure that listening to them brings, making this area more of a difference than an advantage for either speaker. I could live happily with the MG1.6/QRs or CS2.4s, although I would choose the Thiels for the reasons I outline above. 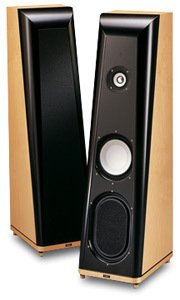 In strict sonic terms, the speaker that the CS2.4 reminds me of more than any other is the Revel Ultima Studio. The CS2.4 shares neutrality and precision with the Studio, along with deep bass, and thinking back, I suspect that both are similarly challenging for an amplifier to drive -- SETs need not apply. Of course, the Studios cost almost $11,000 per pair, considerably more than the CS2.4s. If you are considering purchasing the Revel Studios, or another speaker in their price range, do hear (and see) the Thiel CS2.4s as well. You may save yourself a wad of cash. The Thiel CS2.4 is a great loudspeaker, one of the very best I've heard regardless of price. Its treble soars and its bass plummets, but all the while the CS2.4 sounds utterly neutral and musically communicative. This speaker looks gorgeous and has the earmarks of heirloom-quality craftsmanship. The CS2.4 will be at home in a tweaked-out dedicated listening room or in a finely decorated living room, and its moderate size means it won't take up much space in either. To head off e-mail over the CS2.4's Reviewers' Choice status, I will say that the CS2.4 is certainly one of the best speakers in its price range, but it is not a state-of-the-art offering (Thiel's own CS7.2 would apply here) or a stone-cold bargain (think CS1.6) at almost $4000 per pair. However, for those buyers in between these two models in terms of their budgets, the CS2.4 competes favorably with speakers that cost multiples of its price and thus makes a very strong case for itself. Given all of the praise I heap on the CS2.4, you probably think I'd like to own a pair. Not true. I want five for multichannel music. Price: $3900 USD per pair in standard finishes.